Three anti-Roma pogroms within a month mark a worrying escalation of racist violence by neo-fascist militias in Ukraine, and evidence of official collusion is a deeply sinister added element. The European Roma Rights Centre (ERRC) has expressed its deep concern at the lax response from law enforcement agencies to racially motivated violence, which renders minorities even more vulnerable, and besmirches the image political leaders in Kyiv strive to cultivate of a tolerant, forward-looking nation. The U.S. Embassy in Ukraine called on law enforcement officers to investigate the recent attacks on Roma and tweeted the following: “No one in Ukraine should live in fear because of who they are. We urge law enforcement to investigate recent attacks on Roma. Justice and Tolerance for minority communities are key in the new Ukraine.” https://bit.ly/2khEFm5. In the most recent attack on May 22, ERRC News reported that a group of masked men armed with guns and bats forced Roma families living near the village of Velyka Berezovytsia Ternopil to flee into the forest, and then set fire to their makeshift dwellings. Shots were fired and three people were injured in the attack. The terrified seven adults and 30 children lost all their property and documents in the arson attack. Doctors at the local hospital were forced to call the police when the injured Roma came under renewed attack as they were being brought in for treatment. Just a week earlier, in the village of Rudne in the Lviv region, a 30-strong gang of masked men descended upon Roma shacks at 2a.m. on May 10, dragged people out of their beds, beat them and set their homes alight, destroying all their belongings and forcing them to flee. Police and ambulance responders were on the scene, but no arrests were made. The victims’ whereabouts are unknown. 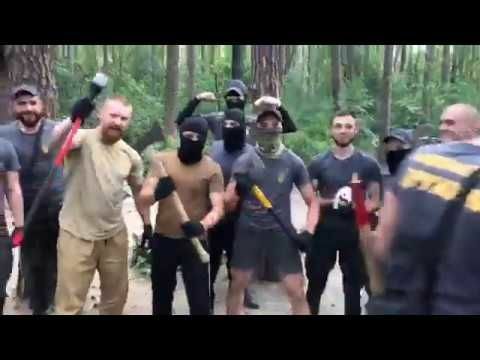 This attack came just 10 days after members of the neo-Nazi paramilitary group C14 filmed themselves carrying out a pogrom in the Lysa Hora nature reserve near Kyiv, where they drove fifteen families from their homes. As reported by ERRC on April 21, a C14 gang, carrying weapons, attacked the Roma. A video posted days later showed whole families with small children fleeing in terror, chased by masked men who hurled stones and sprayed them with gas canisters, before setting their tents ablaze. What is especially sinister is the evidence of official collusion in each of these attacks. Following the first attack, the prominent C14 member Serhiy Mazur openly boasted on his Facebook page about the successful operation, as the result of collaboration between C14 and the Holosiyiv District Administration. The police took no action at first, stated that they had not received any complaints of violence or beatings, and claimed that local representatives and firemen were present during a clean up operation where rubbish left behind by Roma was burned. By April 25, the video footage, eyewitness accounts and media coverage forced the police to announce that a criminal investigation had been initiated. Concerning the May 10 attack in the village of Rudne, the Kharkiv Human Rights Protection Group (KHRPG) reported that unknown persons visited the camp days before the attack and warned the Roma to leave. On May 10, the district administration news service announced that municipal workers, police and security “conducted an explanatory operation" with the Roma, after which they left the territory. Accounts from people in the nearby village suggest that police were actively involved in the attack. After being ordered to investigate by the Human Rights Commissioner, the National Police of Lviv region opened a criminal case of hooliganism. As Jonathan Lee reported in ERRC News, after the third May 22 pogrom, one of the Romani women told our monitor on the ground: “I don’t trust the police. The next day I saw the police officer drinking coffee with one of the guys who attacked our camp.” She added “One of the guys who attacked us threatened to find us even underground if we dare to complain to the police”. Who is C14 and why does it enjoy such impunity? The brazen effrontery of these thugs and the impunity they enjoy beg some fundamental questions about official attitudes to the protection of minorities and the legal standing of ultraviolent fascist groups in Ukraine. C14 first emerged around 2010 as the youth wing of the extremist Svoboda party, and was one of the far-right groups active in the Euromaidan uprising of 2013-2014. Since Russia’s military aggression began in 2014, right-wing militias such as Azov and Right Sector played a role in fighting off the Russian-backed separatists, which earned them significant public admiration. This has translated into tacit support for their criminal actions way behind the front lines. Activists from C14 also insist that the group’s name is not a reference to the 14-word slogan coined by US Nazi David Lane –“We must secure the existence of our people and a future for White Children” – but that C14 just resembles the word Sich (18th century Cossack political entities) in Cyrillic (Січ). In February 2018, two men linked with C14 were charged with the murder of the pro-Russian journalist Oles Buzyna three years earlier. Halya Coynash reported that C14 has advertised its services to prospective ‘donors’ by offering to make trouble for their enemies. It should be troubling that such ‘services’ are on offer from a gang that has official authorization to ‘keep the peace’, as C14 and Kiev's city government signed an agreement late last year allowing C14 to establish a "municipal guard" to patrol the streets; three such militia-run guard forces are already registered in Kiev, and at least 21 operate in other cities. On the same day that Freedom House published a new report warning of the dangers posed by increasingly active extremist groups in Ukraine, news has just come in of a fourth pogrom-style attack on Roma carried out on June 8 by members of the National Druzhyna militia, who first posted threats on Facebook, then broadcast the attack and destruction of the camp on Facebook live (https://bit.ly/2MaITbV). The police have stated that the camp was empty when the militia arrived, so there were no victims and no arrests, and they will not open any criminal proceedings related to this incident. According to the author of the Freedom House report, Kiev-based historian and political scientist Vyacheslav Likhachev, “The most disturbing element of their recent show of force is that so far it has gone fully unpunished by the authorities. Their activities challenge the legitimacy of the state, undermine its democratic institutions, and discredit the country’s law enforcement agencies.” For as long as neo-fascist paramilitaries can act with impunity, and their deeds go unpunished, the Roma of Ukraine are once again hunted and haunted by the spectre of the officially-sanctioned pogroms of the dark times of the 20th Century.